I posted about this over on the eight forums as well. I received this information but don't have a clue how to adjust any options in TestDisk. "Your 3TB drive has a logical 512 B sector size but a physical 4096 B sector size . 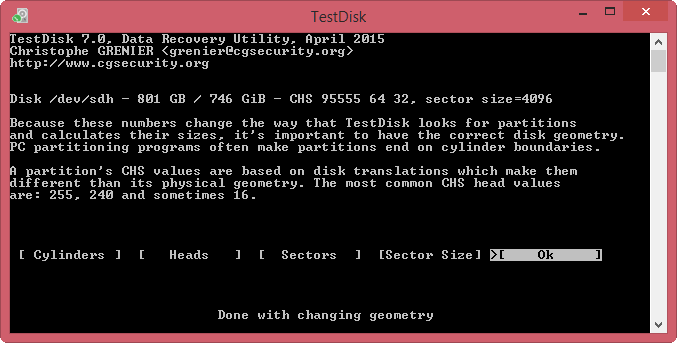 TestDisk reads 512 B sector size. Change it to 4096 in TestDisk and it should be able to read the drive correctly. The lost partitions should show up correctly now. Once this is achieved, use the list command to show all files and copy those to another drive. ( you should have another empty drive connected before you run TestDisk for that.) Only after copying all the files write the partition table found." filewin32_getfilesize(\\.\S:) GetFileSize err Incorrect function. filewin32_setfilepointer(\\.\S:) SetFilePointer err Incorrect function. I received some excellent instructions how to change the sector size, but I am not seeing any change in the reported Disk capacity, so I X'd out of TestDisk before hitting OK. Perhaps I need to hit OK in order for the changes to show? Or am I putting my data at additional risk? I ordered a new USB3 enclosure and put the problematic drive in it. When I connected it to my daughter's laptop, it booted up fine and all data was visible. Disk capacity was showing as 3TB. All appears normal. The only thing I can think of is that the power supply portion of the Seagate Backup Plus drive failed causing the Backup Plus to not power up. When I removed the drive from the Backup Plus enclosure, I put it in a spare USB2 enclosure I had. For whatever reason, the USB2 enclosure electrics must have something different than the failed USb3 enclosure the drive came out of causing the raw file issue. I also tried a USB2 dock I have (for both 3.5 and 2.5 inch drives). It also failed the same way. Once I put the drive in a USB3 enclosure, the drive worked normally. Whew! I then spent a solid day+ moving her files to Amazon Cloud (unlimited photo storage).